Back to School time is just around the corner! I for one cannot wait to get back into a routine and have the kids back in school! I love the quiet time at home with my sewing machine while they are at school! 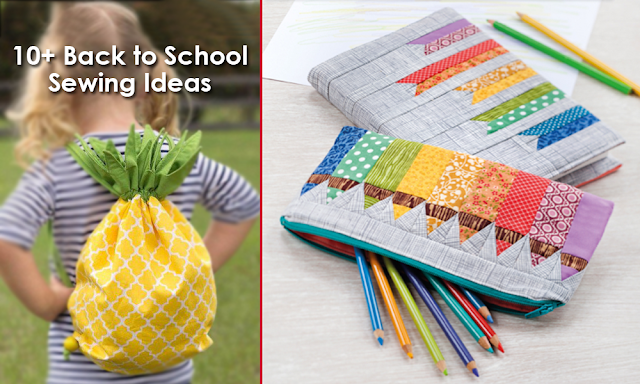 Here are some back to school sewing ideas to get you in the mood! 1. This Toddler Backpack is perfect for those little ones who are headed to school for the first time! How sweet? I cannot believe that my little guy is already going to his second year of preschool, he looks so little in this picture! 2. This School Days Rolie Polie from Riley Blake is adorable! It is perfect for making gifts for teachers and administrators. I also love how bright it is and the fun graphic images! These would be cute for the seat organizers or for pencil pouches. 3. A new Lunch Sack is perfect for those high school kids or even for yourself as a teacher. Heck make one even if it has nothing to do with school, just use it to take to work! This one was made with Boardwalk Delight from Art Gallery Fabrics, swoon right? 4. How adorable is this Crayons Pack fabric? This would make some precious accessories. Like the seat back organizer that you can find a bit further down the list. 5. This Pencil Case from Polka Dot Chair is stinking cute right? I love that she added a little chalkboard vinyl. It makes it so perfect for back to school I can’t even handle it! Try this with the Riley Blake bundle up above. 6. I love this Science School fabric. It has a fun vintage science theme which is unique and awesome! This would be perfect for a pencil case or an adorable backpack! 7. If you have a teenager or a college kiddo this Laptop Case is a perfect back to school gift! Or just make one for yourself, it is a quick and easy project and it is so so so cute! Try it with the science fabric or the fun keyboard fabric just below. 8. How cute is this School Teacher Fabric? I love the keyboards and the sweet motivational teacher phrases. This would make a great lunch sack or pencil pouch for the teacher in your life. 9. Save the planet and make lunch fun with these Reusable Lunch Bags. They are quick and easy to make and they will save you a ton of dough on those plastic bags. Try them in the crayon fabric or any of the sweet fabrics from the bundle below. 10. This School Days Fat Quarter Bundle will give you lots of options for back to school fabric. Try making a lunch sack or a laptop case as a teacher gift with these. 11. This Back of Chair Organizer is such a great project. If you want to get some volunteer hours in ask your kid’s teachers if they need some of these. The are perfect for adding some extra space to already small classrooms! Use the school days fat quarters to make some of these great organizers. 12. What will you make for back to school? Which is your favorite back to school fabric? What are your favorite back to school sewing ideas?